Heart disease is a common problem in dogs and cats of all ages, however the prevalence is greatest in the geriatric population. 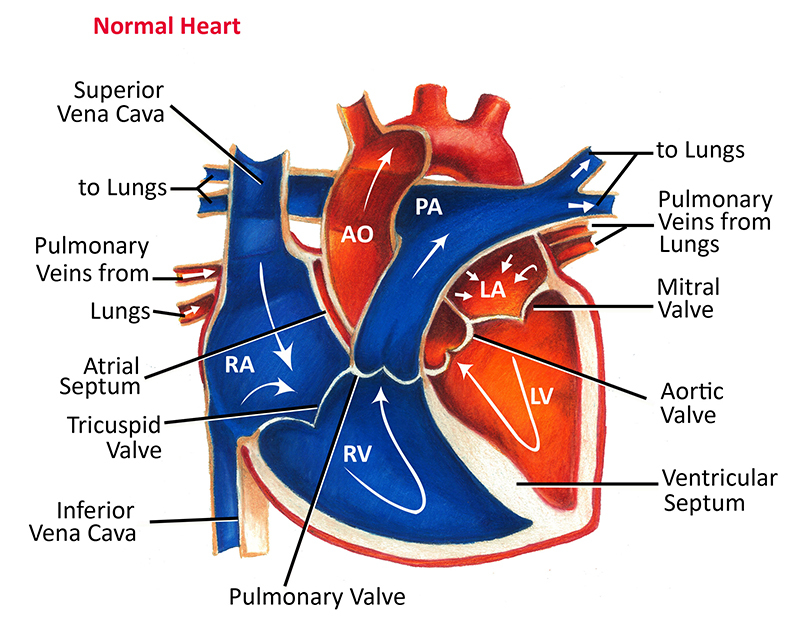 Congenital heart disease refers to problems with the heart that are present from birth. On the contrary, acquired heart disease develops anytime during adulthood. Degenerative mitral valve disease is the most common cardiac disease in dogs (detected in approximately 30% of dogs aged 13 years and older) whereas hypertrophic cardiomyopathy is the most common cardiac disease in cats (prevalence ranging from 15% to 30% of healthy cats). Are certain breeds more likely to develop heart problems? #1. Small breed dogs, including Cavalier King Charles Spaniels and Miniature Poodles. #2. Large to giant breed dogs, including Dobermans, Great Danes and Irish Wolfhounds. The clinical signs associated with heart disease are diverse and varied. On one end of the spectrum, your pet may be completely asymptomatic (often in this scenario the only clue that a problem exists is following detection of a heart murmur by your veterinarian). It is worth mentioning that even if an animal has no obvious clinical signs, a significant underlying heart problem may still exist. Although the above signs may suggest the presence of an underlying heart problem, many other non-cardiac conditions can cause similar clinical signs. If you are concerned, please contact your veterinarian for further advice. 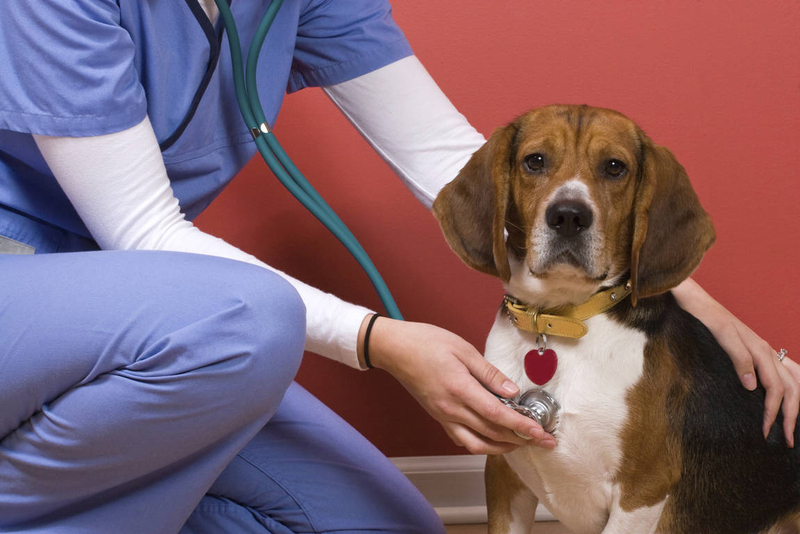 How do you diagnose heart problems in dogs? This involves listening to the heart with the aid of a stethoscope. Heart murmurs are the most commonly detected abnormality. A murmur is an abnormal heart sound caused by turbulence of blood within the heart (the most common reason for blood turbulence is a ‘leaky’ heart valve). A diagnosis is not possible with auscultation alone however it often provides the first clue that an underlying heart problem exists. This refers to an X-ray of the chest. Chest X-rays allow us to look at both the heart and lungs. A common reason for performing X-rays is when your veterinarian is concerned about fluid build-up in the lungs (X-rays allows us to visualise that fluid in many cases). Also known as an ECG, this test involves placement of clips and leads onto the skin, allowing us to assess the rate and rhythm of your pet’s heart. This is a simple procedure used to diagnose arrhythmias, i.e. heart rhythm disturbances. This is essentially an extended ECG used to diagnose intermittent arrhythmias that may not be present during a short in-house ECG recording. Your pet is sent home wearing a harness which contains a device (holter monitor) that continuously records the heart rate and rhythm. The duration of recording is most commonly 24 hours however some holter monitors can record for a longer period if required. This refers to an ultrasound of the heart and is the most important test when evaluating dogs and cats with heart disease. In comparison to other tests available, echocardiography is the only one that can achieve a specific diagnosis in most cases. It enables us to look inside the heart and visualise all chambers and valves. Echocardiography is a difficult skill to learn and requires advanced training. For this reason, only veterinarians with proper training should routinely be performing echocardiography. "Doc, please tell me straight: is it serious?" Not all dogs and cats with heart disease require treatment. In some cases the heart problem is mild enough that it is not expected to cause clinical signs or alter life expectancy. This involves administering one or more medications to control clinical signs and improve quality of life. There are many different medications prescribed to the veterinary cardiac patient, however one of the most commonly used is frusemide. This is a diuretic agent that causes the kidneys to produce more urine, which in turn helps to remove any excess fluid from the lungs. 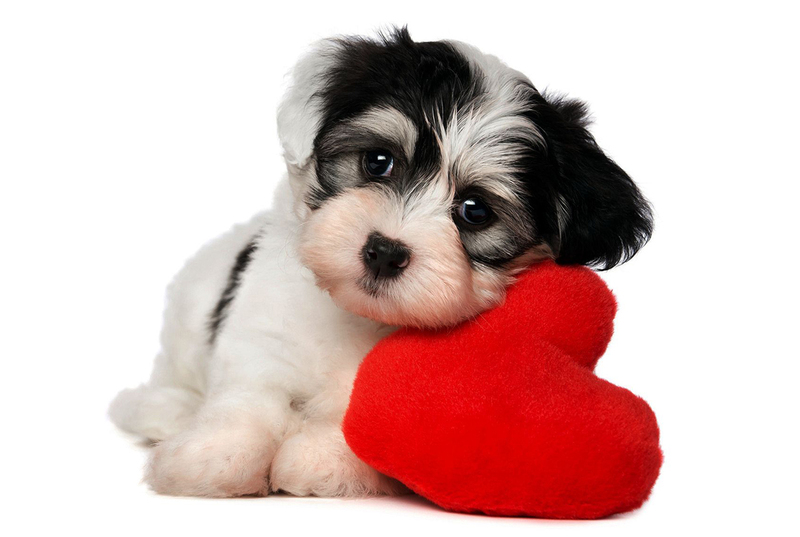 Most often, cardiac disease in dogs and cats is treated medically. Surgery is sometimes an option depending on the specific condition present. There are a few congenital conditions that can be repaired with the aid of minimally invasive keyhole techniques. Are there any other recommendations for dogs with heart disease? Molly, a 6-year old Cavalier King Charles Spaniel, was referred for investigation of a recently detected heart murmur. Other than an occasional dry cough, the owner had not noticed any issues that may have suggested an underlying heart problem. On physical exam, a moderate intensity heart murmur was noted. The remainder of the exam was normal. Echocardiography was recommended to determine the cause of the murmur. Molly was diagnosed with a condition called degenerative mitral valve disease (MVD). 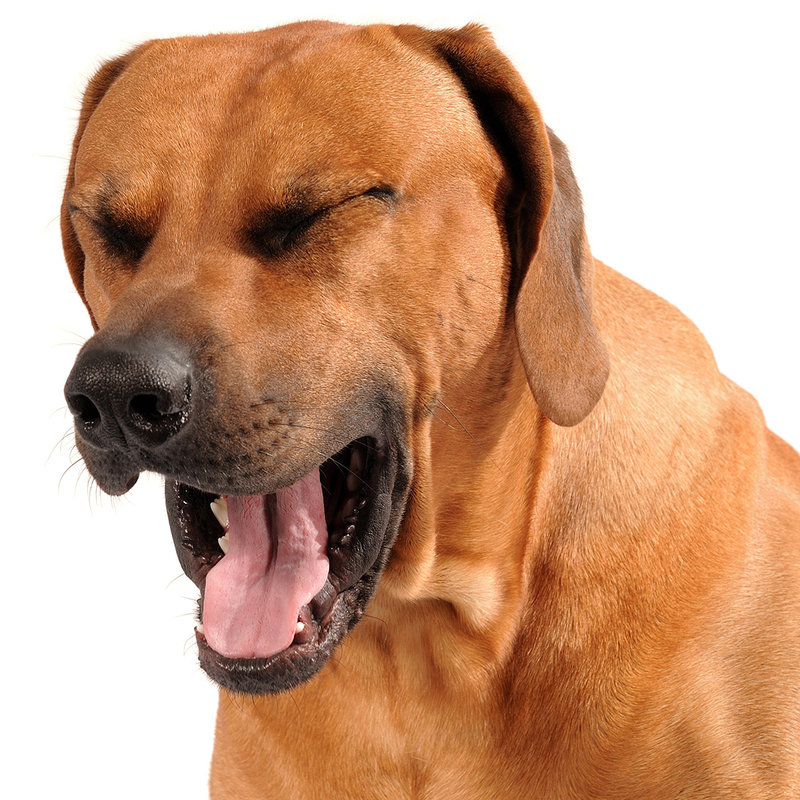 MVD is the most common heart disease to affect dogs. It is an adult onset disease most often developing in middle-aged to older dogs. The cause is unknown however genetic factors are likely important. Unfortunately, the prevalence of MVD is particularly high in Cavalier King Charles Spaniels. This breed can also sometimes develop MVD at a younger age compared to other breeds. The heart is the organ responsible for pumping blood to and from all tissues of the body. The heart is divided into right and left sides. The job of the right side is to pump oxygen-deficient blood returning from the body into the lungs (via the pulmonary artery) where fresh oxygen is collected and carbon dioxide is removed. The oxygen-rich blood returning from the lungs enters the left side of the heart where it is pumped to the tissues and organs of the body (via the aorta). Each side of the heart has two chambers, an upper atrium and a lower ventricle. Between the atrium and ventricle on each side lies a valve – the tricuspid on the right and the mitral on the left – that regulates blood flow between the chambers. As the heart pumps, these valves act as one-way gates, allowing blood to flow from the atrium to the ventricle but also preventing blood from flowing back into the atrium. From the ventricles, blood is pumped into the pulmonary artery (on the right) or the aorta (on the left) through a second series of one-way valves (the pulmonic valve and aortic valve, respectively). MVD results in degeneration of the mitral valve, preventing full closure of the valve and disrupting the one-way gate mechanism. As a result, blood moves across the mitral valve in the wrong direction. The consequence of this ‘leaky’ valve depends on the volume of blood moving across the valve. In mild cases, there may be no measurable adverse effect on the heart or the patient (i.e. in this situation the dog would be asymptomatic). In more severe cases, the heart responds by physically growing and enlarging. In select patients, heart enlargement is so severe that fluid begins to ‘back up’ in the lungs – this is referred to as congestive heart failure and causes an increase in your pet’s breathing rate and effort. 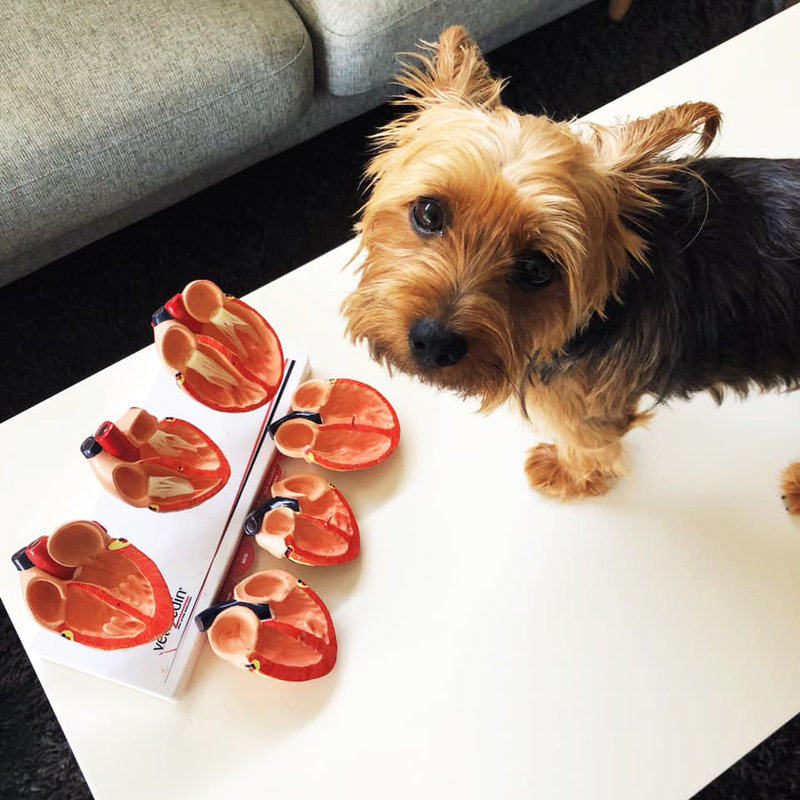 Once heart enlargement develops, it is important your dog is commenced on a lifelong medication called pimobendan (even if your pet is not showing any clinical signs of heart disease). A relatively recent study showed pimobendan delays the onset of congestive heart failure by approximately 15 months. The good news is that Molly’s heart was not enlarged, indicating her disease was quite mild. No treatment was recommended, however her owner was strongly advised to return for a repeat echocardiogram in 6-12 months time to assess for any possible progression. What is the main ‘take home’ message for a dog with MVD? If your veterinarian detects a heart murmur in your dog, there is a reasonable chance it will be due to MVD (particularly if he or she is an adult small to medium breed dog). The best way to obtain an accurate diagnosis is with the aid of echocardiography, ideally performed by a veterinary specialist (e.g. veterinary cardiologist). Even if your pet is asymptomatic you should still strongly consider having an echocardiogram performed given the benefits of early pimobendan administration (as described above). What is the prognosis for dogs with MVD? The prognosis for dogs with MVD is highly variable and depends on the severity of the underlying changes to the heart. The most common clinical consequence of MVD is the development of congestive heart failure. It can take 2-5 years to develop congestive heart failure from this stage of disease. However, some dogs will never develop congestive heart failure within their lifetime (and hence have a normal life expectancy from a cardiac perspective). Congestive heart failure may develop in a shorter period of time. If a dog develops congestive heart failure (again I stress not all dogs will), the average survival time is 9-12 months. It is worth mentioning that despite the presence of congestive heart failure, most dogs have a good quality of life provided they are receiving optimal treatment. Geoff grew up in New Zealand before making the move across the ditch to complete his veterinary training. It was during vet school that he developed a strong interest in cardiology. 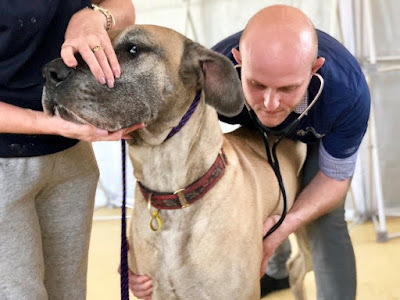 After graduating with honours from the University of Queensland, he completed a 12 month rotating internship at the University of Queensland Veterinary Teaching Hospital. 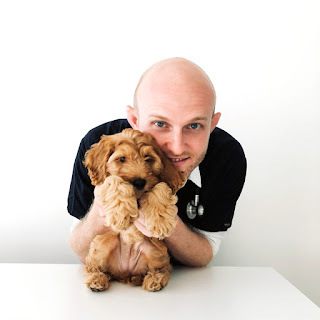 In 2013, Geoff commenced his cardiology training at the University of Sydney Veterinary Teaching Hospital. In 2017 he successfully passed the examination to obtain Diplomate status in the European College of Veterinary Internal Medicine, in the subspecialty of Cardiology. After gaining his specialist qualification, Geoff moved to Melbourne where he worked as a mobile cardiologist for 12 months. 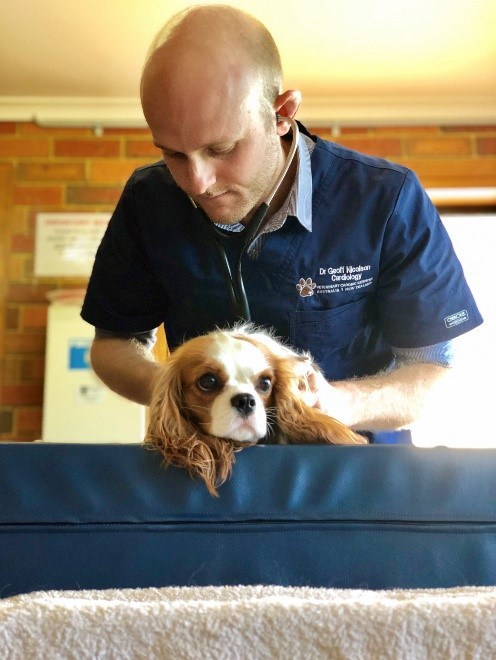 Last year he returned to South East Queensland to establish Veterinary Cardiac Services, a mobile service operating across Brisbane and the Sunshine Coast. Geoff also regularly takes his mobile service to Hobart, Canberra, Townsville and even Singapore. In his spare time Geoff enjoys running and keeping fit, mainly to balance his love of restaurants, food and wine. Geoff and his partner are parents to Charlie, an Australian Silky Terrier with a lot of attitude!